Shelby performed on Show 309, recorded in July 2015, at age 21. She had previously performed on Show 254, recorded in May 2012, at age 18. 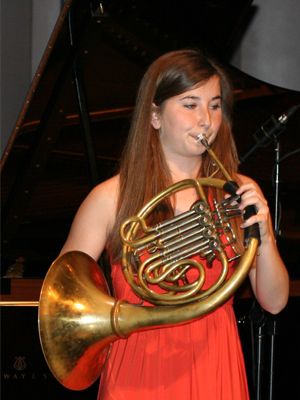 Shelby Nugent (horn), 21, is pursuing a bachelor’s degree in horn performance studying with Gail Williams and Jonathan Boen. While at Northwestern, she has acted as an associate member for the Civic Orchestra of Chicago and will begin her first year as a regular member during the 2015–2016 season. Shelby, from Southern Illinois, also studies with St. Louis Symphony member, Tod Bowermaster. In addition to horn, Shelby is a passionate coffee drinker and enjoys distance running.